Kuwait, January 8, 2017: Concept car turn series production model, the Mercedes-Benz G 500 4x4² has arrived in Kuwait and is available at A.R. Albisher and Z. Alkazemi Company, the authorised general distributor of Mercedez-Benz in Kuwait today announced. A new highlight in the rich history of the G-Class, the G 500 4x4² is a pure new creation in the G-Class family which understands the need for extreme off-road driving with no boundaries, while preserving the legendary Mercedes-Benz comfort and style. 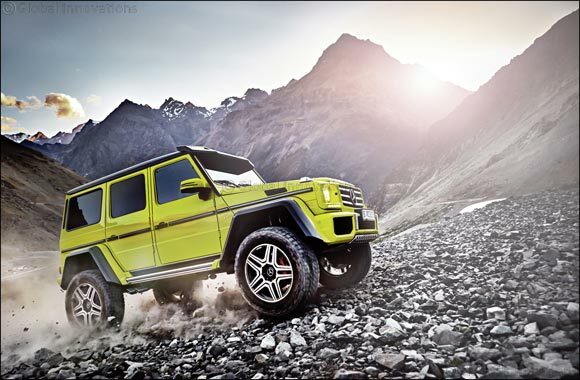 Inspired by the Mercedes-Benz G 63 AMG 6x6 superior all-wheel-drive powertrain, the new series is powered by an all-new Mercedes-Benz biturbo V8 engine with 422 hp and a choice of 22-inch wheels or 18-inch beadlock wheels, carbon-fibre fender flares and roof spoilers with LED lighting body parts, and seductive designo Exclusive range for the interior. Portal axles from the legendary 6x6 with a newly-developed variable chassis and one reduced portal axle increases the ground clearance from 240mm to 450mm, ensuring the machine powers up, or through, any terrain. The chassis is fundamentally based on the series-production G model and offers a perfect symbiosis of sporty dynamism and relaxed comfort, both on the road and off. During dynamic cornering the sporty setting performs sterling work, as the tauter connection of the chassis allows higher cornering speeds. If the driver is more in the mood for pleasurable cruising, the COMFORT setting effortlessly dampens all the unevenness in the ground. In extreme situations such as abrupt evasive manoeuvres, the system automatically switches over to the firm setting for the sake of maximum possible handling safety. The comfortable setting also helps during off-road sessions, because the wheels retain better surface contact. Even on heavily contoured off-road terrain, every surface traction possibility can be utilised effectively. In visual terms the G 500 4x4² raises no doubts as to its passion. The optimized tyres, the huge distance to the ground, the height of nearly 2.25 metres with a width of virtually 2.10 metres and the clear, straight design command respect right from the first glance. Further highlights include the trim with the integral LED light strips above the windscreen and the elaborate partially painted wheel-arch flarings - both in fine carbon fibre. Inside, the G 500 4x4² offers an exclusive ambience with the designo Exclusive package. The seat bolsters and head restraints as well as the dashboard, centre console and armrests in the doors are styled in black designo leather with white contrasting topstitching. The seat surfaces and door panels are covered in DINAMICA microfibre and impress with their attractive diamond-design quilting. The all new enhanced G 500 4x4² is now available at A.R.Albisher and Z.Alkazemi company’s Shuwaikh showroom.